Golfer Georgia Hall is looking to end her first year as a professional on a high over the next fortnight. Next week Hall, 18, from Bournemouth competes for her Ladies European tour card in Morocco for the 2015 season. And she admits the next two weeks will be the most important of her fledgling career, with Hall also currently playing at the Dubai Ladies Masters. "The hardest thing is getting on the tour, once you are on the tour it is better," Hall told BBC Radio Solent. "These two weeks coming up are going to be the biggest two weeks of my life. I just need to keep my focus and do my best." Hall turned professional in the summer after the Women's British Open but had delayed the decision because of a combination of funding concerns and wanting to play in the Curtis Cup. 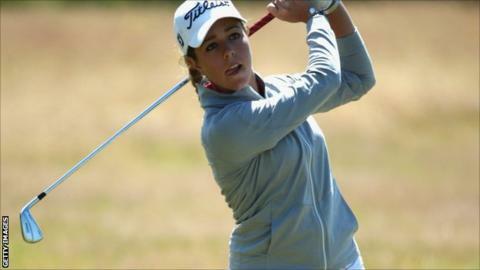 She performed well at the Women's British Open, finishing joint 29th and was the second best-placed amateur. Other career highlights so far include winning double gold at the 2013 Youth Olympic Festival and last year's British Amateur Championship triumph. Hall also earned her first pro tournament victory in September and says her experiences this year have motivated her further for 2015 and beyond. "It's made me more determined and I'm getting closer to my dream," she said. "I have to be patient. "It is a lot of pressure, but it all depends on these two weeks. I just need to keep my focus and do my best." Hall says Dubai will act a near-perfect warm-up for Marrakesh, where she intends to play five rounds of consistent golf as she aims to get into the top 30. "There are a lot people who will be emotional because it's so big, but you have to remain calm," she said. "There are five rounds, in heat with lots of pressure. It's about not making any mistakes, five steady rounds will get you in." After hopefully gaining her tour card, Hall is also clear on her aims for 2015. "Lots of top 10s, maybe a win in there, and I would love to qualify for a couple of majors but the first aim is to get that tour card," she said.